So the level of hardware isn’t exactly impressive, but maybe the pricing will make up for that? Well, I wouldn’t get your hopes up too much. The Tab 4 7-inch WiFi comes in at €199 ($274). Thats not exactly cheap or value for money, on either side of the pond. Considering that you can often manage to procure a new 2013 Nexus 7 for the same amount. The 8-inch version is priced at €269 ($369) and the 10-inch WiFi costs €349 ($478). Finally, the 10-inch with LTE carries a whopping €469 ($643) pricetag. Ouch! Those are some breathtaking numbers considering that you are getting an entry-level tablet in return. Granted, considering that the WiFi version of the 7-inch Galaxy Tab 3 can be found for $130 on Amazon, it’s unlikely that the Tab 4 range will stay at these prices for long. And it has to be remembered that these are pre-order prices on one site, so (hopefully) it’s quite likely that when it is more commonly available the Tab 4 will be more affordable. If you are in the market for an entry-level tablet, does the Galaxy Tab 4 range tick any boxes for you? Do you think they offer value for money at their current prices? If not, what sort of price level would convince you to pull the trigger? Let us know in the comments or via our Google Plus page. 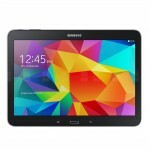 The post Samsung’s Galaxy Tab 4 Range Up For Pre-Order in Europe from €199 appeared first on AndroidHeadlines.com |.